Dagoth Ur, also known as Voryn Dagoth and the Sharmat, was the immortal Lord High Councilor of House Dagoth, who dwelt beneath Red Mountain with his kin, the Ash Vampires, and legions of Corprus monsters. As a mortal, Lord Voryn Dagoth was one of the few who knew about the Heart of Lorkhan, together with Vivec, Almalexia, Sotha Sil and their leader Lord Indoril Nerevar. Dagoth claimed that the Dwemer high priest Kagrenac was drawing power from the Heart using special tools to create a mechanical god, Numidium, that would be used against the Chimer. After Azura confirmed Dagoth's story, action was taken to stop the Dwemer, starting a war that culminated in the disappearance of the Dwemer and the transformation of the Chimer into the Dunmer. Some sources insist that Nerevar died at the hands of the Tribunal, that they murdered him when he left Red Mountain to consult with them, and it was they who fought Dagoth Ur for the Tools, and Dagoth fought to avenge Nerevar's death. These assertions were vehemently denied by the Tribunal Temple, as well as Vivec; even Dagoth Ur's account contradicts this, as he admits that he and Nerevar came to blows beneath the mountain. Regardless, the Tribunal did not obey Nerevar's dying wish: years later, when Sotha Sil had learned their secrets, the Tribunal returned to Red Mountain and used Kagrenac's Tools to steal divine powers for themselves. 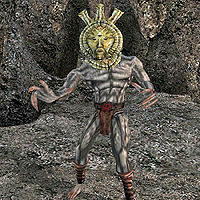 Dagoth Ur also managed to forge a connection to the Heart somehow: he remained alive and immortal, albeit temporarily bodiless and presumed dead. The Tribunal's ambition proved to be disastrous, despite the many great and heroic deeds they accomplished in their divine states. In 2E 882, as the Tribunal journeyed to Red Mountain to renew their connection to the Heart in a bathing ritual, they once again encountered Dagoth Ur, reborn to a new incarnation, and with divine power that could more than match their own. They were unable to enter Red Mountain's Heart Chamber, and were forced to retreat, barely escaping with their lives. Dagoth Ur had sole control of the Heart from this point on, and grew stronger while the Tribunal grew weaker. Now possessing only one of Kagrenac's tools, the gauntlet Wraithguard, the Tribunal could not - dared not - even pass the bounds of their own Ghostfence to recapture the others. As Sotha Sil and Almalexia withdrew from the world, Vivec stood alone in maintaining the Ghostfence, an effort that took so much of his energies he could not stir out of his palace, and his Temple's Ordinators ran out of his control and became ever more fanatical and rigid as the faith of the Dunmer wavered. Meanwhile, Dagoth Ur set about constructing Akulakhan, the Second Numidium, a brass machine god he would use to conquer all of Tamriel. For more information, see the main Lore article. Dialogue must be checked, and needs a better presentation/layout, especially the "final questions" part. "Come, Nerevar. Friend or traitor, come. Come and look upon the Heart, and Akulakhan. And bring Wraithguard... I have need of it." "Come to the Heart Chamber. I wait for you there, where we last met, countless ages ago." "Come to me, through fire and war. I welcome you." "Welcome, Moon-and-Star. I have prepared a place for you." "Come. Bring Wraithguard to the Heart Chamber. Together let us free the cursed false gods." "Welcome, Nerevar. Together we shall speak for the Law and the Land, and shall drive the mongrel dogs of the Empire from Morrowind." "Is this how you honor the Sixth House, and the tribe unmourned? Come to me openly, and not by stealth." "Dagoth Ur welcomes you, Nerevar, my old friend. But to this place where destiny is made. Why have you come unprepared?" "Welcome, Moon-and-Star, to this place where destiny is made." "What a fool you are. I'm a god. How can you kill a god? What a grand and intoxicating innocence. How could you be so naive? There is no escape. No Recall or Intervention can work in this place. Come. Lay down your weapons. It is not too late for my mercy." "This is the end. The bitter, bitter end." "Strange. This outcome I did not foresee. That you would come unprepared." "Until I see you better prepared, we have nothing to discuss." "It began here. It will end here. Have you any parting words? Or would you prefer to skip the speeches, and get to our business. [sic] You are the challenger here, after all. So to you goes the courtesy of the first blow." "Have you something more to say?" "This is the place of destiny. And destiny may only be shaped by the holder of Kagrenac's Tools. I do not know what you think to accomplish. But raise your hand against me, and I shall destroy you." "I am glad that this time you did not come unprepared." "My first question is: Are you really Nerevar reborn?" By the grace of gods and fate, I am Nerevar reborn. I'm a loyal servant of the Emperor. I am a self-willed hero, and I make my own fate. I know no more than you do. "That is bitter. The gods and fates are cruel. I served you faithfully once, Lord Nerevar, and you repaid me with death. I hope this time it will be you who pays for your faithlessness." "Then I salute you for your faithful service to your lord. And I curse you and your Emperors as my enemies, for your stealing and spoiling Morrowind and degrading the Dunmer race. Your death and humiliation will give me special pleasure." "You are bold. I honor your independence. You are one to teach the gods their limits. I hope the bards will praise the glory of your death in song." "What a world.... Perhaps we shall never know. But as I have sympathy for you, and the melancholy fate of all mortals, I shall weep for your death." "My second question is: if you win, what do you plan to do with the power from the Heart? Will you make yourself a god, and establish a thearchy? Or will you complete Akulakhan, and dispute control of Tamriel with the Septims? Or will you share the Heart with your followers, as I have, and breed a new race of divine immortals?" I have my own, secret plan for the Heart. "You will follow the model of the Tribunal? That is a dull and unenterprising ambition. See what the Tribunal have done. They've sacrificed the honor and dignity of the Dunmer race, and handed over our ancient land to the mongrel dogs of the Empire. You may mean well, but you lack vision. You are not worthy of the Heart." "A noble ambition. And anyone who should make war upon the Septims should be my friend. A pity we cannot trust one another as allies." "You have a noble spirit. I share the power I have from the Heart to help free mortals from their ancient fears of the gods. Who knows what we might be capable of once we no longer fear death? Your goal is worthy, and I honor you for it." "Well. Perhaps there may be surprises in store for me yet. Or perhaps you obscure your plans on principle. Or perhaps you are an instinctive bluffer. No matter." "My final question is: If I had offered to let you join me, would you have surrendered Wraithguard, Sunder, and Keening to me to seal your oath?" No, I would never join you. No, I would never surrender the tools. Yes, perhaps, with the right guarantees. Yes, if I had a cunning plan. "Thank you for the forthright response. And now, if you have any questions, ask them. Otherwise, you are the challenger. I await your first blow." "An interesting response. You might have been willing to join me, but never to surrender the tools. Very interesting. I'm glad I didn't try to bargain with you. And now, if you have any questions, ask them. Otherwise, you are the challenger. I await your first blow." "Since it hardly matters, let me assure you... there are no guarantees that would help you once I had my hands on those tools. Pity I didn't try to bargain with you. It might have made things so much easier. But now we'll never know. Pity. But now, if you have any questions, ask them. Otherwise, you are the challenger. I await your first blow." "Yes, of course. I doubt that any cunning plan would have been of much use once I had the tools in hand. But now we'll never know. Pity. But now, if you have any questions, ask them. Otherwise, you are the challenger. I await your first blow." End the dialog and prepare to attack. What is your plan for the Heart? "I will continue to draw divine power from the Heart and distribute it to my kin and followers. I will continue to broadcast divine power upon the blight winds, so that it will touch each soul in Vvardenfell, and then more broadly, across the waters to the rest of Morrowind and Tamriel. In time, every mortal in Tamriel shall feel the liberating contact with the divine." What is your plan for the Sixth House? "The Sixth House will serve as the elite cadre of our movement. As cultists evolve through various stages of enlightenment, they will become, as suits their abilities, either holy warriors or priests. Their duty is to prepare themselves for service; their joy and liberation is to enter even-more-deeply into the profound enlightenment of the divine dreamworld." What is your plan for the Dunmer? "I will free the Dunmer from the Imperial yoke, and cast down the false gods of the Temple. I will lead them out of their ancient superstitions, and gift them with intimate knowledge of the divine. Then, perhaps, when Morrowind is once again restored to its ancient glories, it will be time to consider whether the Dunmer should cultivate ambitions of empire." How do you justify your crimes? "If, by my crimes, you mean the inevitable suffering and destruction caused by war, then I accept the burden of leadership. The Sixth House cannot be restored without war. Enlightenment cannot grow back without the risk of upsetting the tradition-bound and complacent herd. And the Mongrel armies of the Empire cannot be expelled from Morrowind without bloodshed. As I have charity and compassion, I grieve. But our mission is just and noble." "I have no idea what happened to the Dwemer, I have been denied the opportunity to study Wraithguard, and I am not sure how much of Kagrenac's lore was invented in his tools, and how much in his own sorcery and mastery. I have long studied Kagrenac, and have come to admire his wisdom and craft. Someday, after the campaigns of the Sixth House are secure, I hope to have time to dedicate to this mystery." Why are you building Akulakhan? "Akulakhan will serve three purposes. First, it will be the champion of my armies, liberating first Vvardenfell, then Morrowind, and then, perhaps the rest of Tamriel. Second, it will serve as a sower and cultivator of the divine substance derived from the Heart. Three, it will serve as the prominent banner and symbol of our cause -- to defy the Empire, to liberate mortals from ancient superstitions, and to glorify our crusade against the gods." I'm finished talking, Defend yourself. "Very well. If you are impatient to begin. Go ahead. You are the challenger. To you goes the first blow." "I believe we've said all there is to be said. Now only deeds can resolve this matter." 'our business:' "You are the challenger here, after all. So to you goes the courtesy of the first blow. I'm waiting...."
"Now that you have come to me here, there can be but one result. Many times I have rehearsed speeches offering to share this place with you. 'If you dare to defy the gods, take my hand.' 'To seal the oath of alliance, you shall give me Wraithguard.' 'You have ability. Special gifts you don't even understand. Serve me, and I can help you master those gifts.'" "Now that you have come to me here, there can be but one result. Many times I have considered offering to share this place with you. I considered offering to accept your oath of service. You might try to buy my trust by giving me Wraithguard, Keening, and Sunder. I thought we might once again be friends... comrades... brothers in arms." "But I have won this place and power by right of conquest. By right of daring and enterprise. I will not risk it to cunning and deceit. I offer you no deals. If you are my enemy, I cannot trust you. And even if you are not my enemy, I cannot let you live. "It will all be decided here. I believe I will prevail. But I cannot be sure, and I am vain enough that, should I fall, I would wish to be remembered in my own words. So, if you have final questions you would ask, ask them now. I have final questions I would ask you, if you would answer." "Oh. Please, Nerevar! Spare me!" "Hah-hah-hah-hah. Oh, dear me. Forgive me, but I am enjoying this." "I surrender! I surrender! Hah-hah-hah-hah-hah!" "Omnipotent. Omniscient. Sovereign. Immutable. How sweet it is to be a god!" "Farewell, sweet Nerevar. Better luck on your next incarnation." "Persistent, aren't you." "This is getting tiresome." "STUpid...."
"You are a stubborn thing, Nerevar." "This is taking too long." "Come on!" "Damn this thing…"
Dagoth Ur also appears in Legends, as a character in Return to Clockwork City story expansion. He also appears as a card in the Houses of Morrowind card expansion. This page was last modified on 7 April 2019, at 18:08.